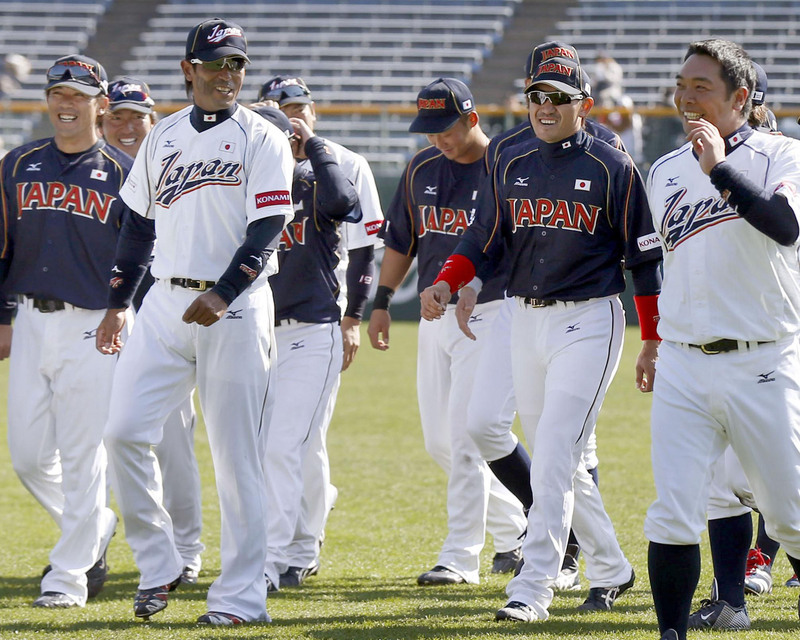 MIYAZAKI - Japan manager Koji Yamamoto announced his 28-man roster for the 2013 World Baseball Classic with few surprises on Wednesday as the two-time defending champs wrapped up their fifth day of training. Cut from the first official roster were last year’s Central and Pacific leagues’ stolen base champs, a slow slugger with an injured hand and a pair of Chunichi Dragons relievers. The tournament, which begins play March 2, puts limits on pitcher workloads, forcing teams to be pitching heavy. Yamamoto’s squad has 13 pitchers, three catchers, seven infielders— including Atsunori Inaba — who can still play the outfield, and five outfielders. The surprise exclusions were the two fastest members of the squad, Chunichi Dragons center fielder Yohei Oshima and Tohoku Rakuten Golden Eagles center fielder Ryo Hijirisawa. Each man led his league in stolen bases last year. Oshima was third in the CL in batting average and fourth in on-base percentage and won a Golden Glove, but has had trouble this month with detached cartilage in his left elbow. Hijirisawa isn’t as much of an offensive presence but stole 54 bases last year. Hijirisawa did not bat in that game but went 2-for-2 in Wednesday’s intrasquad game that preceded the roster selection. Batting coach Kazuyoshi Tatsunami said after the game, however, that Wednesday’s results would not matter much in the final decision. The other three exclusions were less surprising. Yomiuri Giants third baseman Shuichi Murata suffered a finger injury before camp, although he could be completely fit in time for the WBC. Dragons reliever Takuya Asao, the CL MVP in 2011, suffered a rotator cuff injury last summer and has been dealing with discomfort this spring. His teammate, right-hander Daisuke Yamai, has had no luck mastering the slick tournament ball and suffered through his second straight poor outing in the intrasquad game on Wednesday. Asao appeared to be the first casualty of the day when he failed to take the mound in Wednesday’s game. “We won’t do something that is going to contribute to an injury,” said pitching coach Tsuyoshi Yoda, who said he and head pitching coach Osamu Higashio had talked it over on Tuesday and got Yamamoto’s consent to make the switch. Yamai took the mound in his teammate’s place and allowed three hits but only one run because the leadoff runner was caught trying to steal and a rocket off the bat of the Softbank Hawks’ Yuichi Honda was caught for the third out. Hiroshima Carp ace Kenta Maeda made the team despite barely being getting his fastball over 135 kph in Sunday’s game. Seibu Lions ace Hideaki Wakui also looked far from ready on Wednesday, but like Maeda probably benefitted from the plan to keep 13 of the 15 pitchers invited to the training camp. With the exception of Wakui and Yamai, the pitching looked quite good on Wednesday. Although every pitcher had a few balls that got away and badly missed their targets, there was a lot of good execution. Hirokazu Sawamura of the Giants gave up a leadoff double in the second inning but threw his two-seam fastball to perfection to escape trouble with a pair of groundouts. Kenji Otonari of the Fukuoka Softbank Hawks threw two perfect innings. Yamamoto said the exact roles on the team were still up for grabs as most of the position players were not yet in their best condition and the Dragons duo of Asao and Yamai had been the strongest original candidates to fill the closer’s job. The most obvious candidates for the big job in the bullpen would be the Hawks’ current closer, Masahiko Morifuku, Wakui, who closed last year for the Lions, or submariner Kazuhisa Makita, who sealed wins for Seibu in 2011 and won the PL Rookie of the Year Award. The team has one day left of practice in Miyazaki before traveling to Osaka on Friday and playing exhibition games against Australia at Kyocera Dome on Saturday and Sunday. Japan is grouped in the first round with Cuba, China and Brazil in Pool A in Fukuoka, while Australia is playing its first-round WBC games in Pool B in Taiwan.